10.21.07 Chess-in-the-Schools, the not-for-profit educational organization that teaches chess to kindergarten through eighth grade children in New York's inner-city public schools, offers a two-day Teacher Training Institute with the goal of assisting teachers to sucessfully implement chess programs in their schools. 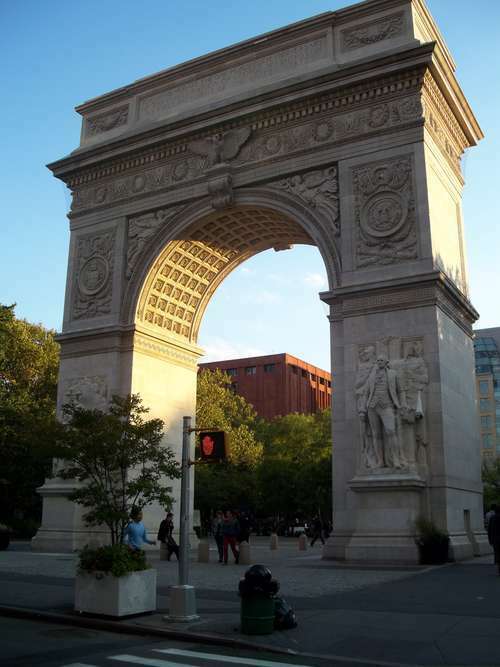 Your intrepid reporter recently travelled to New York, took the training and returned with these impressions. 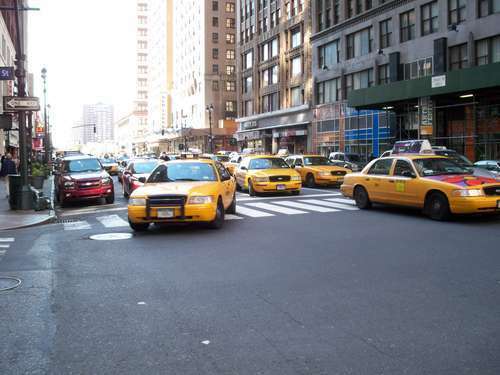 Taxis fill the street outside the Chess-in-the-Schools offices on Eighth Avenue. 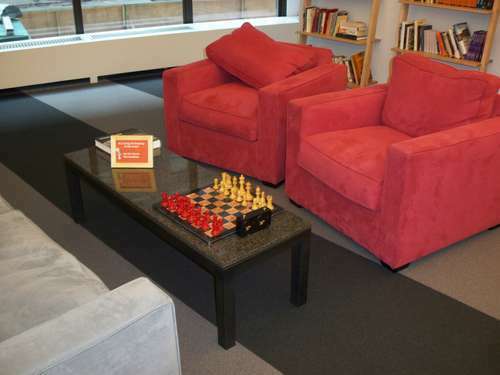 The Chess-in-the-Schools Teacher Training Institute is a relatively new program that provides teachers and would-be chess club leaders an opportunity to learn about the Chess-in-the-Schools curriculum, materials and approach to teaching chess as part of the public school experience. 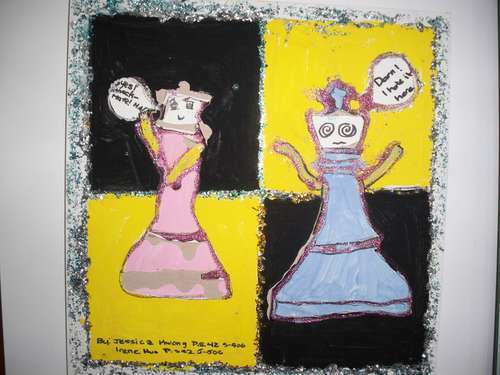 Although Chess-in-the-Schools has done some outreach with the Miami-Dade Public School System in Florida, as far as we know, ChessMaine is the first entity outside New York City to participate in the Teacher Training Institute. 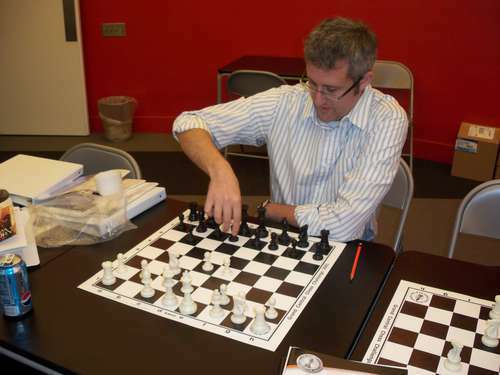 The two-day training was lead by Chess-in-the-Schools staff member Eric Hutchins and included a thorough examination and discussion of the organization's curricula for teaching chess from an absolute beginner level to the more advanced tournament and competitive levels. 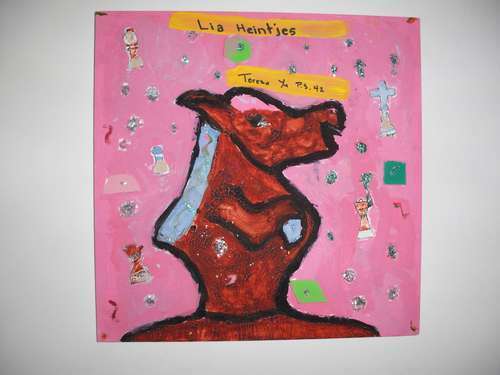 The materials were well presented and both educational and entertaining. It's our hope that a similar training can be given in Maine sometime in the near future. We will keep you posted on developments in this venture. 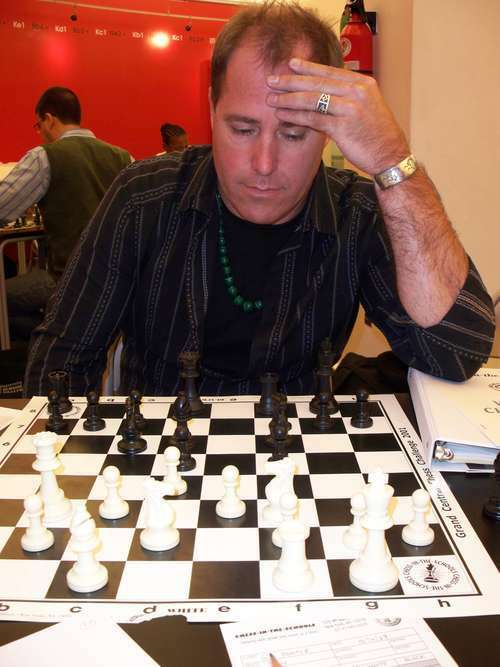 Chess-in-the-Schools Teacher Training Institute instructor, Eric Hutchins, discussing the concepts of check and checkmate and the three options a player must examine before attempting to get out of check. The notation you see above Eric are the moves from one of the most reproduced games in history. 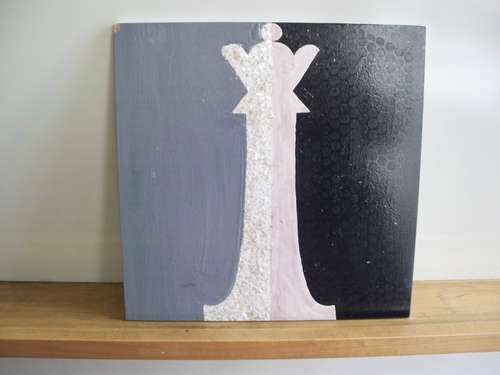 The game, dubbed the Game of the Century, by then Chess Review writer Hans Kmoch, was played by Grandmaster Donald Byrne and Robert Fischer at the Rosenwald Memorial Tournament in New York City on October 17, 1956. Fischer, a thirteen-year-old at the time, won this game and went on in the following year to win the United States Championship without a single loss or draw. Teachers at the Institute trying out some newly-learned concepts. 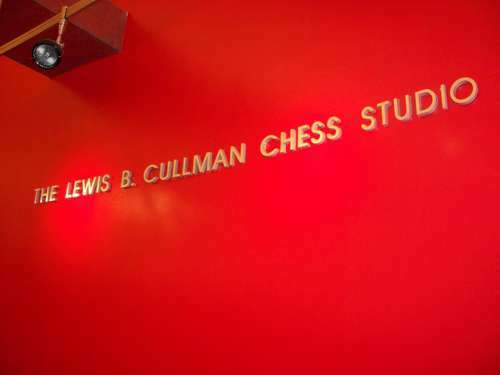 The two-day training was held at the Chess-in-the-Schools offices in downtown Manhattan in a room dedicated to Board of Trustees Chair, Lewis Cullman. Teacher Training Institute participant, Tom Sjogren, ponders his position. Chess-in-the-Schools College Bound Program student and Teacher Training Institute Assistant, Jose Paredes, checks out the extensive in-house chess library. 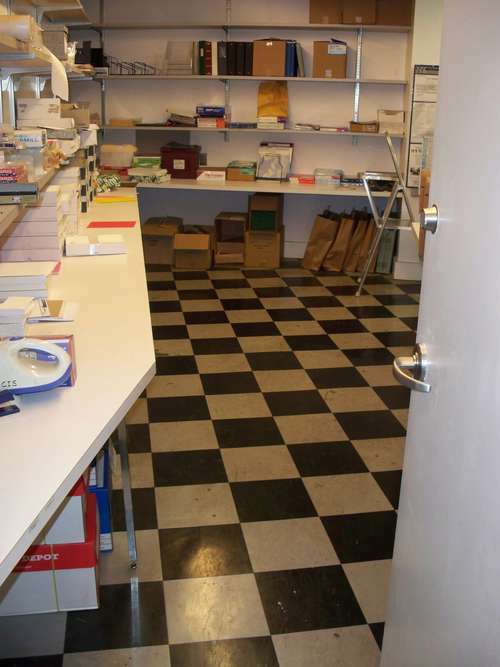 you could even get a game in on the store room floor. 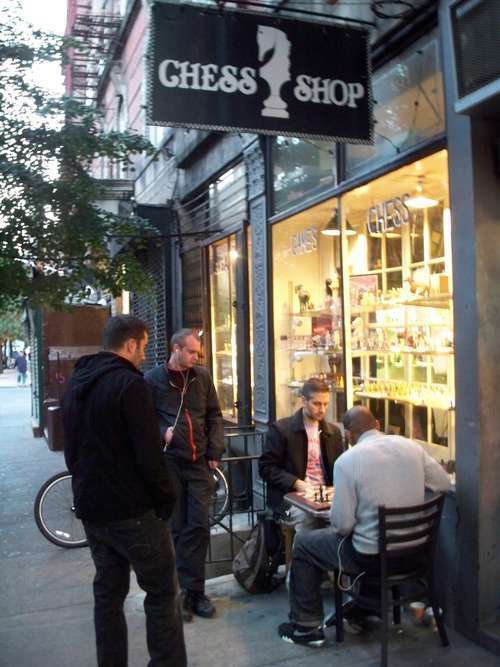 In-between classes at the Institute we headed to some of Manhattan's most popular chess haunts beginning with the Marshall Chess Club. There's almost always a tournament underway at the Marshall. 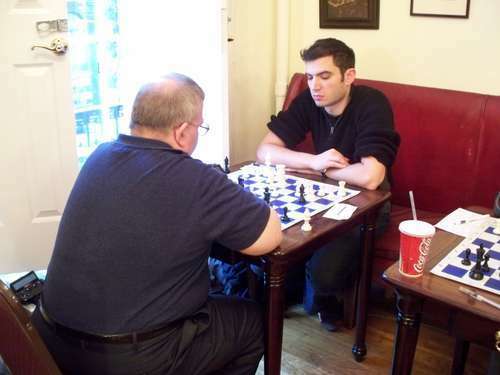 Here Benjamin Katz (2083) plays the white pieces vs. International Master Jay Bonin (2427). 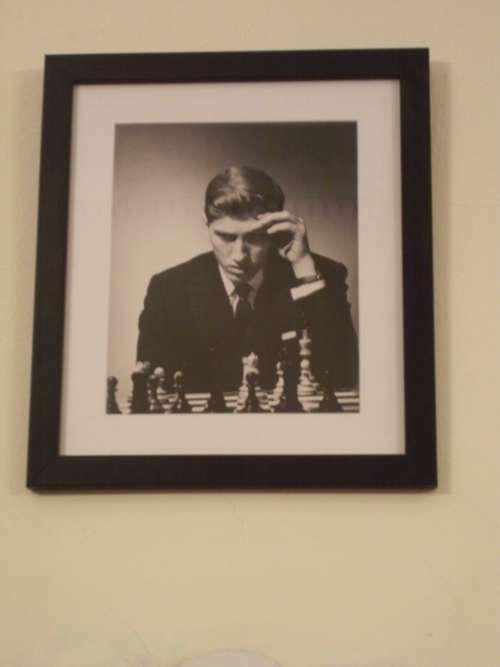 A portrait of a young Bobby Fischer hangs in the tournament room. 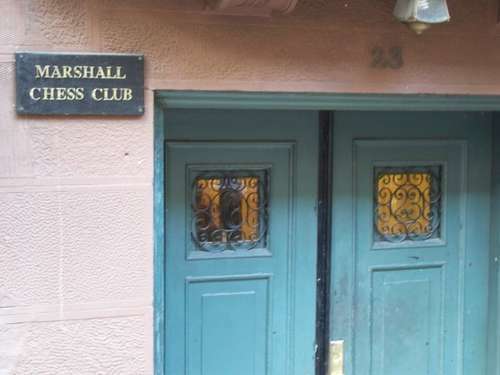 The Marshall exudes chess history. 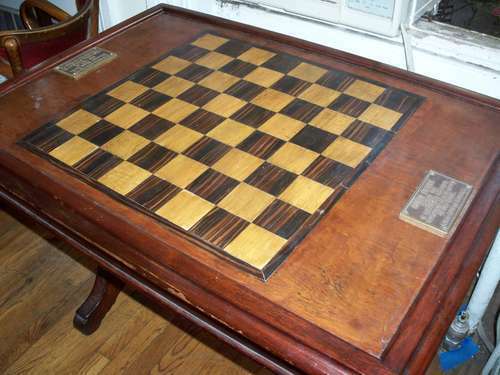 This table was used by many famous grandmasters including Jose Raul Capablanca and Robert J. Fischer. 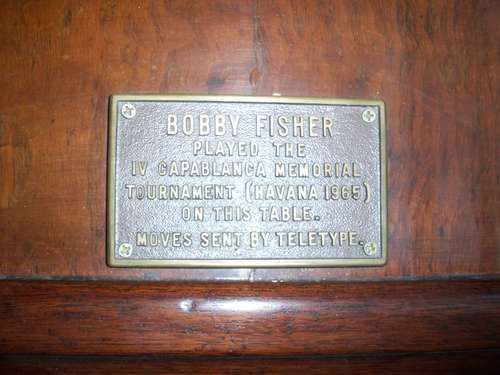 One of the inscription plates on the "Capablanca Table." 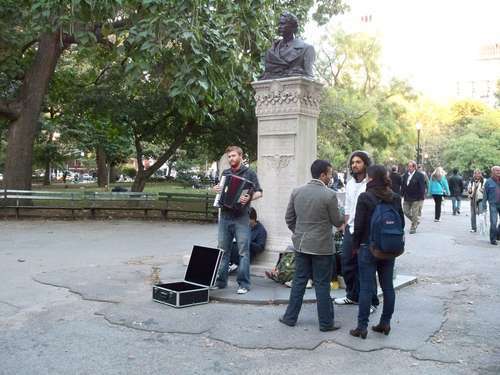 After kibbitzing at the Marshall it was off to the Village and Washington Square Park. 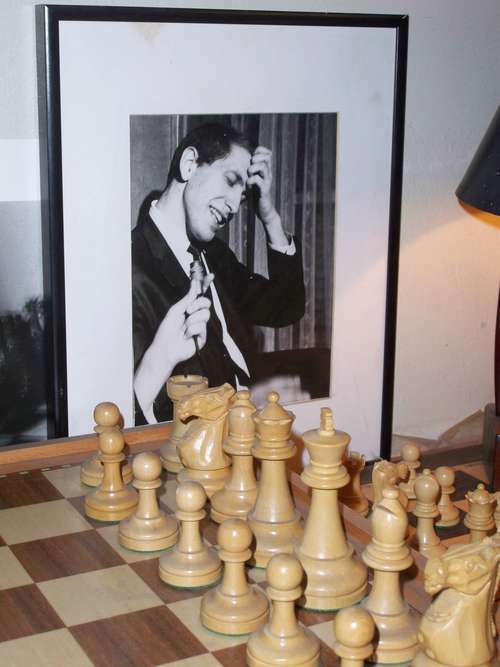 The Park's chess activity first broached mainstream public conciousness with the help of Fred Waitzkin's book-turned-movie Searching for Bobby Fischer, which describes the life of his podigy chess-playing son Joshua. 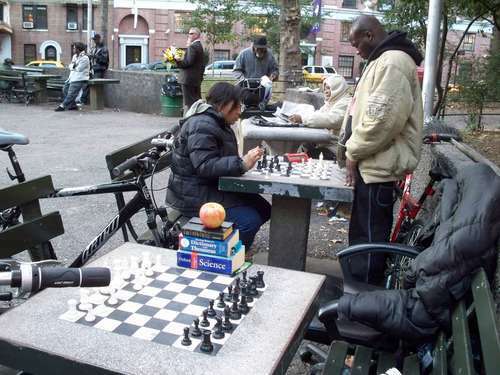 Washington Square Park has its share of chess hustlers and many of the games are played with money at stake. It's also a great place to get some delicious, cheap eats. 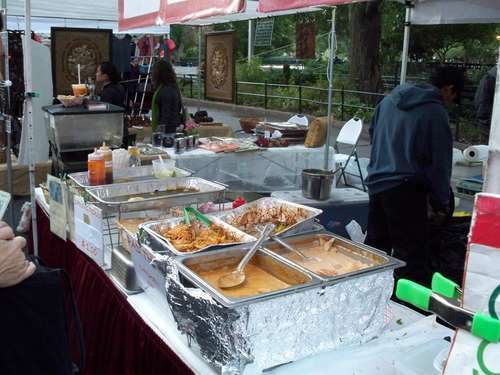 This Thai food stand was part of a street fair at the south end of the Park. 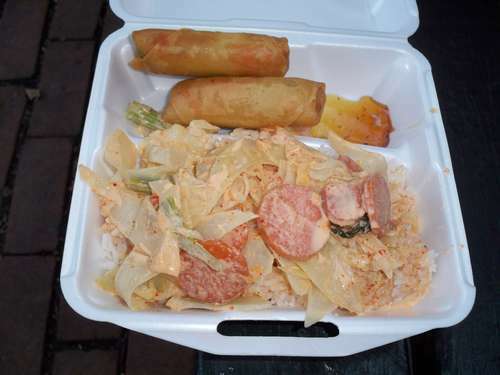 Padang Curry and fried spring rolls. 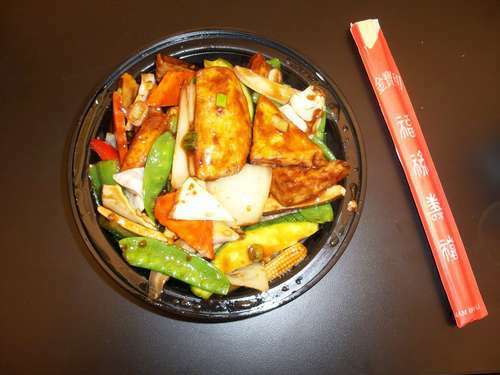 Tofu and mixed vegetables with a delightfully spicy sauce. After dinner we ventured into the heart of the Village and the Village Chess Shop. 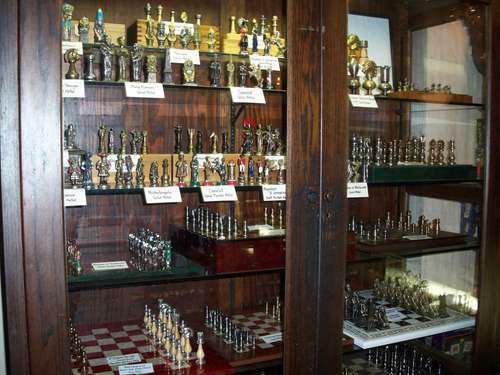 The Village Chess Shop features hundreds of sets and boards from around the world. 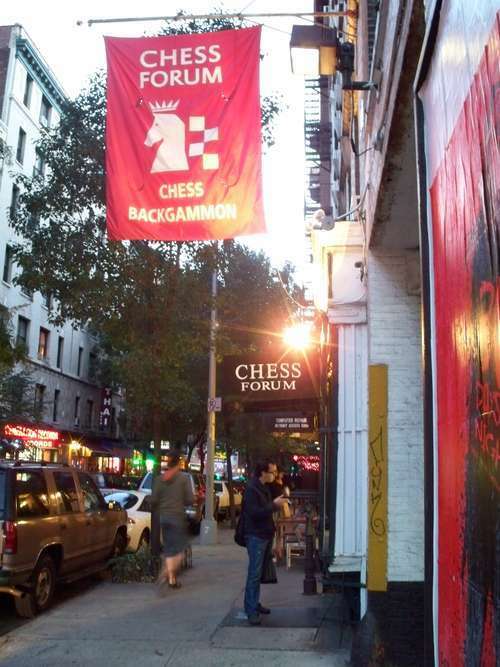 Literally across the street from the Village Chess Shop is the Chess Forum. 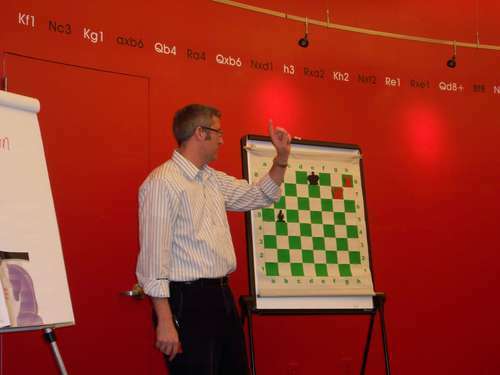 Another photo of New York's favorite chess son is displayed on the wall of the Chess Forum. After two days of classes, chess and gastronomical delights, the Empire State Building bids us adieu. I like your story a lot! Great article! 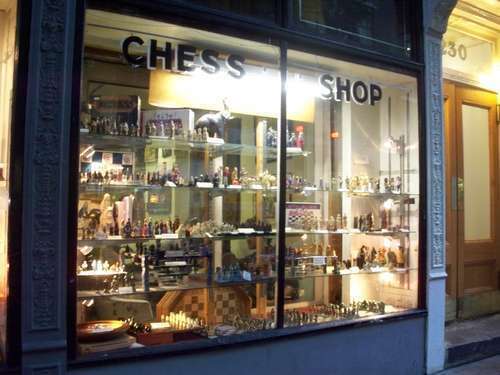 Imagine-2 chess shops on one street. If we had that here in Maine my wife would never see me! "so and so was with him at all times to keep Bobby sane". Had to share that! That food looked good too. Hope you had fun there, looks like you did. Keep up with the good work on the site! Great pictures and fond memories. Thanks for posting. 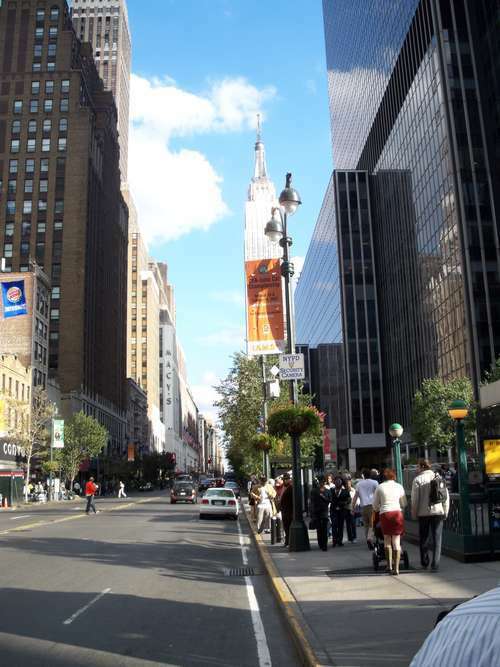 Hi...thanks for the story on New York, my home from 1953 to 1981...miss it. 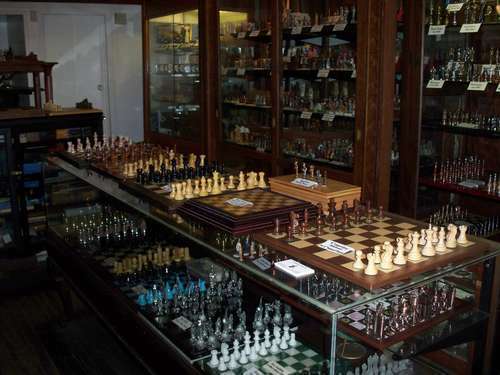 I always visit the chess store in the village for a couple of games. I used to live on east 10th and avenue B for $35 a month rent. Ginsberg was my neighbor.